Contains a combination of enzymes for facilitating digestion. Improves absorption of fats, protein and total energy in vulnerable people. Modern lifestyles are at the root of a growing incidence of digestive problems, even when there is sometimes no actual underlying disease. If probiotics have emerged as a powerful and effective tool in this area, digestive enzyme supplements are, for their part, equally important. 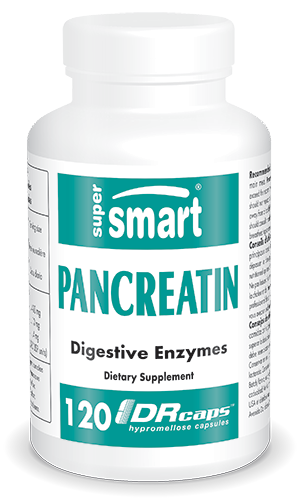 • Pancreatin is a combination of enzymes which eases digestion and prevents digestive problems. It consists primarily of proteases, amylases and lipases which respectively help to break down protein, starch and fats into smaller elements. These enzymes act synergistically to fully support digestion and improve the body’s absorption of various nutrients from the alimentary bolus. • Our “10X” pancreatin is ten times more powerful than chemical pancreatin. Sourced from porcine pancreas, it is identical in every respect to human pancreatin. It corresponds more closely to human use, can be produced in abundance and the amount of active principles (proteases, lipases and amylases) can be clearly established since it is immediately harvested and frozen so as to preserve all its properties. • The proteases (proteolytic enzymes) it contains enable dietary proteins to be broken down into smaller, more easily absorbed particles. This effect is boosted by the presence of trypsin and chymotrypsin, two pancreatic endoproteases. Trypsin activates chymotrypsin and pancreatic lipases. • The water-soluble pancreatic lipases, active on emulsified substrates, enable fatty acids to be released from the majority of long-chain triglycerides. Without pancreatic lipases, fats are only partially digested and sometimes not at all. • The three pancreatic amylases (alpha, beta and gamma) play an essential role in hydrolysing the different forms of starch (amylose and amylopectin). • The synergistic action of these porcine pancreatic enzymes thus covers all the digestive processes and constitutes a natural and completely safe remedy for certain pancreatic deficiencies. • When taken before or immediately after a main meal, Pancreatin acts at a digestive level. When ingested outside of meal times, it has a “systemic” action which works on the body as a whole: it boosts immunity, encourages weight loss, helps control food allergies, counteracts joint inflammation and supports cardiovascular health by regulating the amount of fibrin circulating in the bloodstream. Other ingredients: hydroxypropylmethylcellulose, microcrystalline cellulose, magnesium stearate.